LONDON (Reuters) - Rarely has the world's most important and powerful central bank been so isolated. As the Federal Reserve prepares the ground for another interest rate hike, most other central banks are moving in the opposite direction. And the divergence is widening. No fewer than 53 central banks have eased monetary policy since the start of last year, almost all by lowering rates. Indeed, the pace of policy easing nearly everywhere is accelerating even as the Fed nears its second hike of the cycle. This raises several questions. If the global recovery is firmly rooted, why are so many central banks cutting rates? Can the global economy handle rising U.S. rates, and perhaps a stronger dollar that follows? Will the Fed be forced - again - to slow the pace of tightening or even abandon it altogether? "I can't ever remember a situation when we've seen anything like this before," said Torsten Slok, chief international economist at Deutsche Bank in New York and a former International Monetary Fund economist. "When I was at the IMF there was only one global business cycle. In the late 1990s and early 2000s it would have been impossible to imagine the kind of decoupling we have today," he said. The divergence can drive business costs and trade flows, lead to outsized exchange rate moves and highlight vulnerabilities in the global financial system, casting doubt on whether the world can cope with relatively higher U.S. borrowing costs and dollar. Deflationary forces from the oil price plunge to $50 from $115 in the second half of 2014 kick-started central banks into action at the beginning of last year. Fourteen eased policy in January 2015, 11 in February and 12 in March. Denmark's central bank cut rates four times in as many weeks. The number of monthly rate cuts dwindled as the year progressed, troughing at three each in August and October, before the Fed delivered its first rate hike in a decade that December. But even though oil has rebounded 75 percent from its multi-year lows, the pace of monetary easing is picking up. Twelve central banks loosened policy in March, 10 in April and 11 in May. Indeed, 11 central banks have begun easing cycles since the Fed raised rates in December. At one level, the divergence suggests the U.S. economy is on a stronger footing than the rest of the world. The U.S. economy is relatively closed, relying less on trade than many others. Imports and exports account for no more than 15 percent of U.S. growth, a proportion that's more than twice that in most of the major developed and emerging economies. Yet the Fed has already baulked at raising rates, both before and after its December move, precisely because of its fears over the global spillover effects from more tightening. Financial markets and emerging economies are the main areas of concern. Both are potentially vulnerable to a rising dollar and higher U.S. bond yields that could follow from higher U.S. rates. From mid-2014 to the end of last year the dollar rose around 25 percent against a basket of currencies, effectively a tightening of U.S. monetary policy which, according to Goldman Sachs, helped tighten U.S. financial conditions by almost 200 basis points. There's a view that this did more damage to the rest of the world through large-scale emerging market capital flight and China's policy wobbles than the United States, where job growth and economic activity help up reasonably well. The Organization for Economic Cooperation and Development on Wednesday urged governments to boost spending to lift the world economy out of a "low-growth trap". It said global growth will meander along at 3 percent this year, its slowest pace since the financial crisis for a second year in a row. 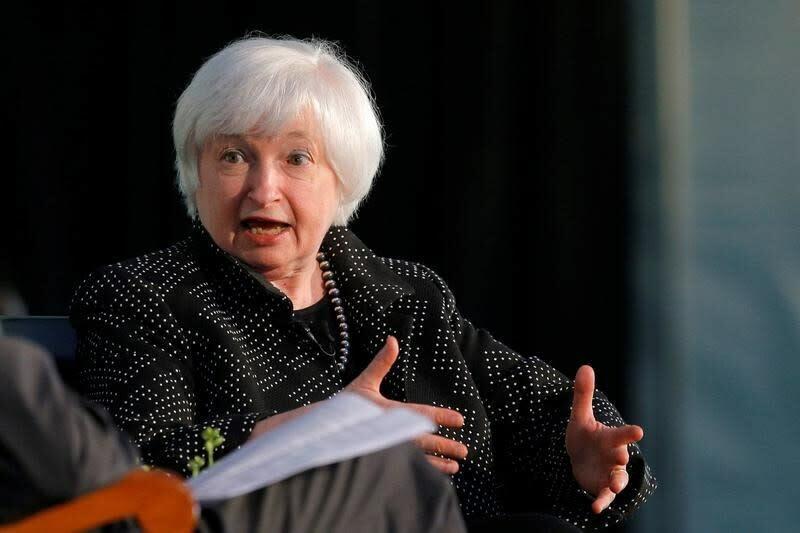 Global conditions, China and the dollar have featured prominently in speeches by Fed chair Janet Yellen and other Fed officials over the last six months, a clear indication they are acutely aware of the global impact of higher U.S. rates. But with dozens of other central banks in easing mode, conditions have abated around 100 basis points since the turn of the year, helping support global asset prices and giving the Fed leeway to raise rates again. Francesco Garzarelli, co-head of global Macro and Markets Research at Goldman Sachs, said the Fed effectively participated in the global easing cycle this year by not following up last December's hike with another increase. "Markets have seen the Fed stop and go twice, but eventually the hike will come, maybe in June," he said. Garzarelli argued that inflation would need to pick up around the world for other central banks to change course. And echoing the OECD, he said the pressure on central banks to loosen monetary policy would lessen if governments shouldered more responsibility for boosting growth via fiscal policy. "That transition is slowly underway, and the interplay between monetary and fiscal authorities may shift market expectations," he said.